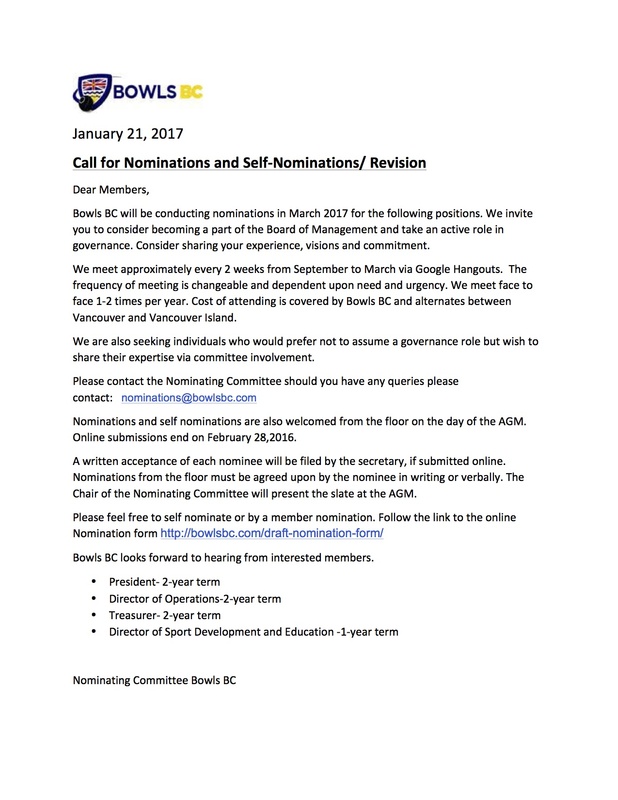 Bowls BC calls for individuals to submit names of candidates to serve on the Board. The Board is seeking candidates to play a role in the stewardship of an organization in transition to a new culture that reflects values such as engagement, transparency, accountability, and other attributes representing leading edge governance. Candidates will have the skill-sets, expertise and experience necessary to help create and implement a Provincial vision for bowls in British Columbia, leading to a legacy of success on and off the greens. In addition to providing leadership in their respective portfolio, qualified candidates will be prepared to participate in discussions on all aspects of Bowls BC’s work and to be part of the collective decision making process.